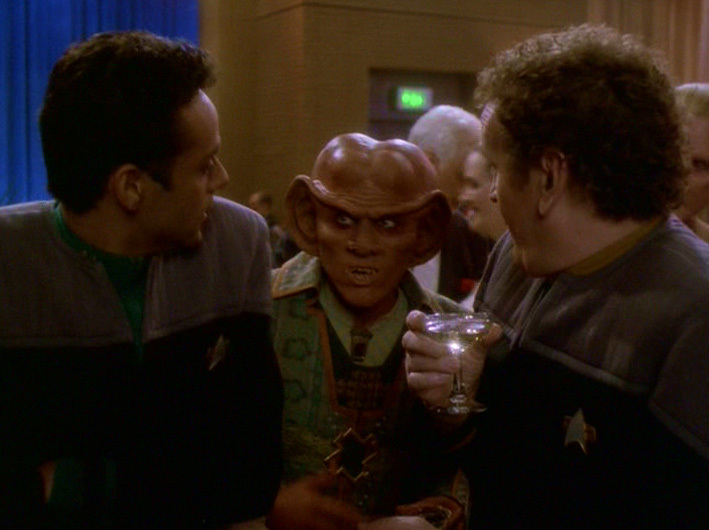 Quark: Earth’s nothing more than a rotating ball of boredom. Jake Sisko: Any idea where you’re gonna live? Miles O’Brien: No, Keiko and I’re still mulling over a few possibilities. Worf: Have you ever considered Minsk? Miles O’Brien: I don’t think that’s on our list. Benjamin Sisko: New Orleans is a gorgeous city. Kasidy Yates: I’ve heard great things about Paris. Ezri Dax: Jadzia loved Rio. Odo: Well, you’ve certainly got a lot of choices. Miles O’Brien: Yeah, too many, hm? 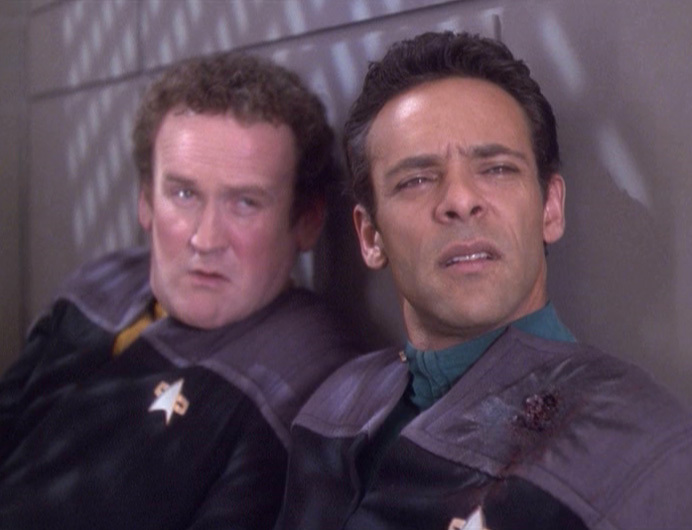 Julian Bashir: I can’t look away for a second. Miles O’Brien: Just fix the shoulder… Careful! Julian Bashir: Sit still, or you’re gonna end up with one arm shorter than the other! Miles O’Brien: You’d do anything to beat me at darts. 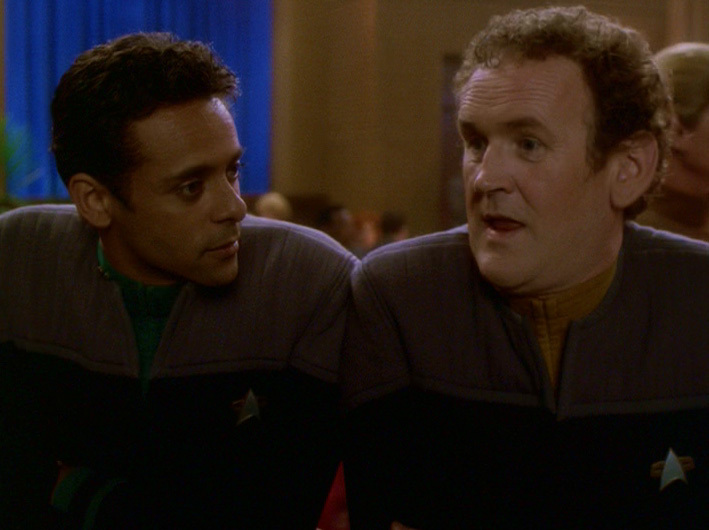 Miles O’Brien: [on Bashir and Dax] I don’t get it. He’s interested, she’s interested… What’s the problem? 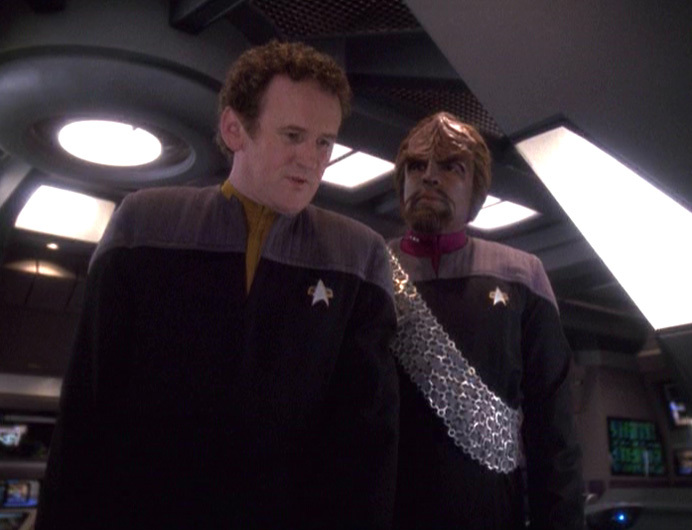 Worf: He is an overgrown child, and she is very… confused. Miles O’Brien: It could still work. Julian Bashir: One thing’s for sure: Sloan knew he had the perfect bait, that I wouldn’t be able to resist it. But there was one thing he failed to consider. Miles O’Brien: And what’s that? Julian Bashir: You. To Miles Edward O’Brien! Miles O’Brien: To friendship. Well, I’d better get home. Keiko is holding dinner for me. Miles O’Brien: Yeah, well, she’s a helluva woman. Julian Bashir: That’s why you love her. Miles O’Brien: M-hm, that’s right – that’s why I love her… You wanna come? Miles O’Brien: Aha! Here we go. 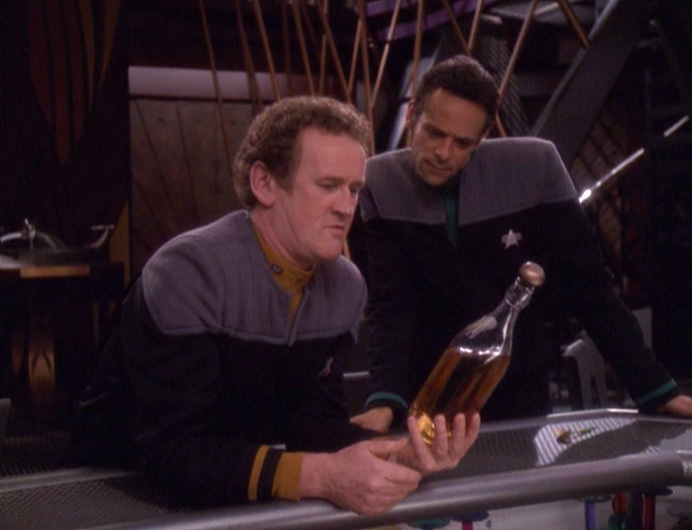 I knew Quark was hoarding a bottle of the good stuff. Julian Bashir: [inspects the label] This is older than I am. Miles O’Brien: What? …I’m drinking with a child! Miles O’Brien: It’s the tunnel. Miles O’Brien: You know, the… the tunnel to the great beyond. Julian Bashir: Oh – it is. I must say, I’m… a bit disappointed; I expected it to be more elaborate. 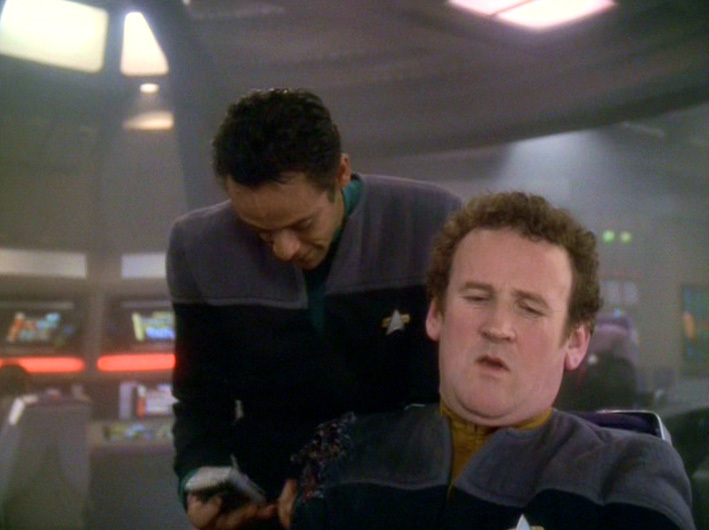 Miles O’Brien: [of Keiko] She always said I… I liked you more than I liked her. Julian Bashir: Well, maybe, maybe you do, a bit more. Miles O’Brien: What? Are you crazy? She’s my wife, I love her! Julian Bashir: Of course you love her – she’s your wife. 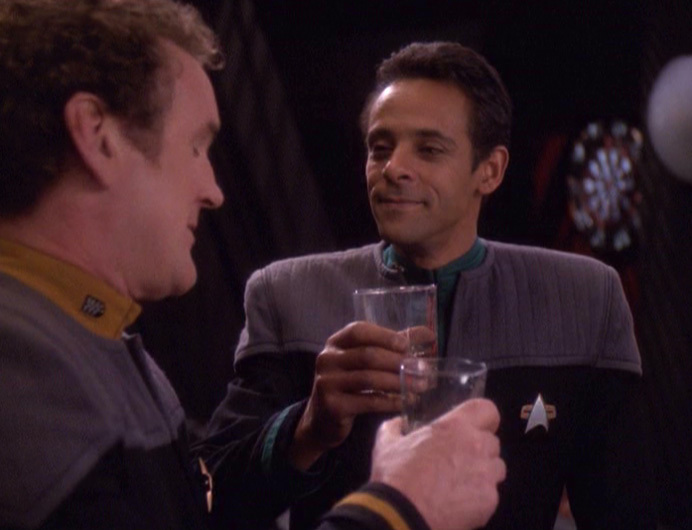 Julian Bashir: I’m just saying, maybe you like me a bit more, that’s all. Miles O’Brien: I do not. Julian Bashir: You spend more time with me. Miles O’Brien: We work together! Julian Bashir: We have more in common. Miles O’Brien: Julian, you are beginning to annoy me. Julian Bashir: Darts, racquetball, Vic’s lounge, the Alamo… Need I go on? Miles O’Brien: I *love* my wife. Julian Bashir: And I love Ezri – passionately. Miles O’Brien: Have you told her? Julian Bashir: Not yet. But I will. Miles O’Brien: Oh, yeah? Huh… When? Julian Bashir: When I’m ready. It’s just that I… like you… a bit more. See? There, I’ve admitted it. Miles O’Brien: Yeah, well – I *love* my wife. 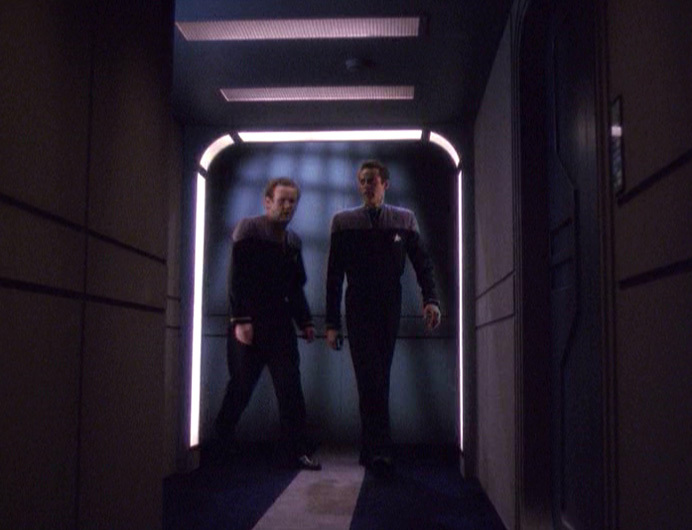 Miles O’Brien: I wish I knew how long we’ve been in here. Julian Bashir: 23 minutes and 11 seconds. Miles O’Brien: I’m going with you. Miles O’Brien: You heard me. And it’s not open to debate. If you’re determined to go on this lunatic mission inside Sloan’s head, then somebody with an ounce of sanity has to be with you! 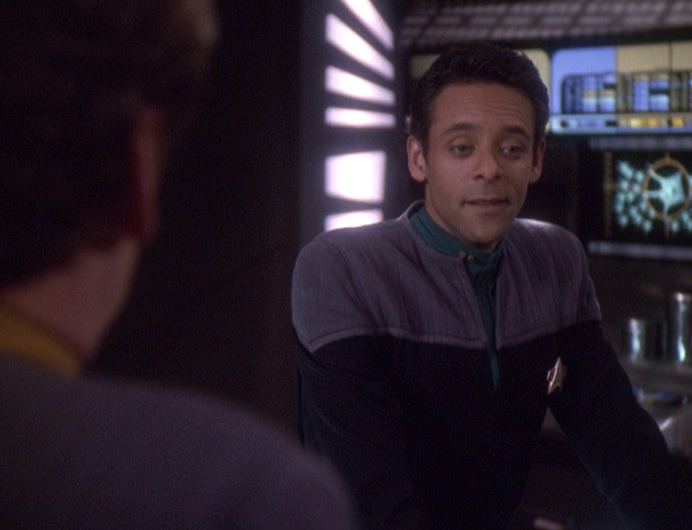 Julian Bashir: You just wanna come because you don’t want Captain Sisko to find out what we’re doing. Miles O’Brien: Well, there’s that too.